Baking from scratch can save a lot of money. Learn why you should stock flours in your pantry. One of the biggest ways that we save money around here is baking from scratch. I’ve received a fair amount of chiding for that over the years. Friends would mock my Suzie Homemaker practices. But, honestly? Baked goods made “from scratch” taste better and generally are less expensive than their manufactured counterparts. Sure, you can get some things “for free,” using coupons. But, often those items are neither the tastiest nor the cheapest. Now, I’m not saying that I never buy store bought. Au contraire. There is a time and a place for everything. But, as a general rule, I think homebaking gives the biggest return on the investment in terms of taste, quality, and value. Flour is one of the major building blocks of baking. Essentially, it is a powder ground from cereal grains, seeds, or roots. Wheat flour is most commonly used in the United States and therefore the most widely available. I can usually get a 5 pound bag of unbleached flour for as low as a dollar and regularly on sale for about a buck fifty. When not on sale, the prices in my neighborhood hover between three and four dollars a bag. It’s definitely worth your while to stock up when you see a sale. Personally, I would consider $2 a decent price and if I found it for less, I would buy several bags, whether I needed it or not. This past month as stores have clearanced their excess from the holiday baking season, I’ve added to my stock pile even though it wasn’t quite depleted. It’s rare that there are coupons for flour, but starting today you can print this coupon for $.75 off Gold Medal flour. With Easter fast approaching, flour sales should be prevalent. This is a great time to stockpile. Print as many as you can (usually two per computer) and keep your eyes peeled for a sale. There is a range of wheat flours available. 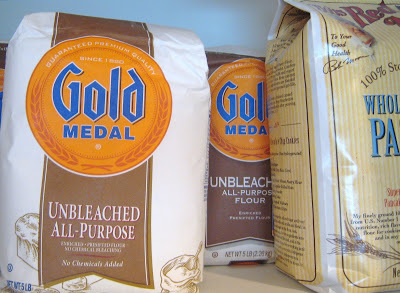 Bleached and unbleached are interchangeable all-purpose flours, though I prefer unbleached. Bread flour is higher in gluten and best suited for recipes using yeast. Pastry flour is high in starch and has a softer texture, making it better for pie crusts and baked goods that call for baking soda or baking powder. Self-rising flour includes the leavening in it. As our family has attempted to incorporate more whole grains into our diet, I’ve added whole wheat and whole wheat pastry flour to my pantry. These cost a little bit more, about $2.50 for a 5# bag — on sale. Whole wheat flours can turn rancid quickly and are best stored in the refrigerator or freezer. Flour is also made from buckwheat, rice, corn, oats, rye, spelt, and barley. As gluten-free diets become more widespread, the variety of flours available is also increasing. More on gluten-free baking later this week. If you have a choice between “steel-ground” and “stone-ground,” choose stone ground. Steel rollers or hammers produce heat that destroys valuable nutrients in the flour. True flour aficianados would recomend grinding your own. When you’re measuring flour, the most accurate method is to use a scale. Flour manufacturers vary in how they grind it; 1 cup from one company may be substantially heavier than the flour of another company. To account for these differences, measuring by weight is truly the best way. If you don’t have a scale, stir the flour first to aerate it, then spoon it into the measuring cup. Scrape the top level with a knife. Don’t tap or pack the flour into the cup. All flour should be stored airtight. Six months at room temperature is a good rule of thumb for all-purpose and bread flours. Temperatures higher than 70°F can encourage the development of mold or attract bugs. 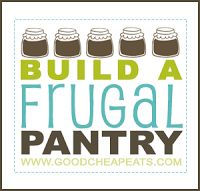 Flour is essential to the frugal pantry. Baking from scratch tastes better than store bought and generally costs less. The fact that you can customize your baked goods means that you can also boost the nutrition of the final product as well as tailor it to your family’s preferences. What’s your favorite thing to make with flour? Want the dish on delicious ways to act your wage? Subscribe to GCE in a reader or via email. For more do-it-yourself inspiration, visit A Soft Place to Land. What Can You Make with Whole Grains? Your blog is becoming extremely useful! Thank you for all of your knowledge! It would smell rancid if it were. I don’t really know the shelf life of it. It depends on how long it’s been exposed to air and light. If it doesn’t smell good, I would say possibly. But, that said, I’ve had it in a canister for several months and not had a problem. I just recently learned that some brands add bromate to their flour (a carcinogen banned in many countries.) They are not required to list it on the label which is horrible. I’m sure store-bought baked goods are full of bromate and other unsavory ingredients. King Arthur Flour has never and will never add potassium bromate to their flour so that is what I’ve been trying to stock my pantry with. Look for labels that say “unbromated” or grind your own. @Amanda, I “think” that is in bleached flours, correct? That if you use unbleached, it should be fine? @Jessica, Unbleached flours are aged with potassium bromate or iodate while bleached flour is gassed with chlorine dioxide from what I’ve read. I could be wrong but I’m only buying King Arthur or organic flour now and I have a wheat grinder on my Christmas wish list too. @Amanda, interesting. Your last comment sent me on a google mission and I didn’t find a definitive answer. Thanks! Some people wonder if it is truly cheaper, I don’t know but I do know that for my family we can easily go through two store bought loafs of bread for lunch and my kids would be hungry still, store bought bread is basically air IMHO, while the whole wheat sandwhich bread I make is thick, good for my kids AND filling.